We are engaged in offering Santoor. We are a top notch supplier of Santoor. 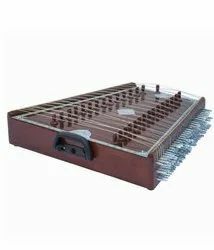 We are amongst the most reputed names in the industry, offering Santoor. 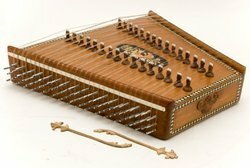 The santoor is a 94 or 123 stringed instrument family of hammered dulcimer, indigenous to the Kashmir valley as a Indian folk instrument. "Shata-tantri-veena", or hundred stringed lute, it was know in our ancient times. made of selected wood, top performance. We are the best trader and supplier of different Santoor. Made from seasoned wood with 75 strings, 25 notes, best quality, with case, sticks and tuning key. We are a top-notch organization, engaged in providing Santoor. We take pleasure in introducing ourselves as leading firm by offering Wooden Santoor. Due to our devoted professionals, we have been accomplished to offer an extensive series of Wooden Santoor. In order to meet excellent quality standards, we are supplying Santoor. Banking on our enriched industry experience, we are able to supply Santoor. We are a top notch supplier of Musical Santoor. From our wide consignment, we are affianced in supplying Santoor. In order to meet excellent quality standards, we are supplying Santoor .